Burnham Manor and Estate is the former residence of Lord Ventry. Dating back to the 1700,s it has played a large part in the history of the Dingle Peninsula . Today the estate is over 50 acres of grazing , woodlands , lagoons and historic buildings . The wildlife inhabiting and surrounding the estate is second to none all lending to a relaxing and tranquile athmosphere . The Manor house is now used as the only all girls Irish speaking boarding school in Ireland . Set in this glorious estate is the home of Burnham Riding Centre. Coming from a family steeped in horses and having ridden and competed throughout childhood , then going on to ride and manage Showjumping yards throughout europe for most of the 1990,s Amanda Sweeney returned to Ireland with the intention of coaching and producing showjumping riders and equines . Requested by Cairde Coláiste Íde to base the riding centre on the grounds of the boarding school in Kerry , the stable yard was reopened in 1998 to provide onsite riding tutition for Coláiste Íde students. Such was the demand for equestrian activities from Coláiste Íde students it quickly became home for their ponies and horses, Show-Jumping , Pony Club and Interschools Teams . Students successfully went on to represent their school to compete at local and national level. Following on with more achivements in the next few years and by opening up the riding centre to the public , students from Burnham Riding Centre joined forces with Coláiste Íde students to represent West Kerry and the Gealtacht in team equestrian competitions . 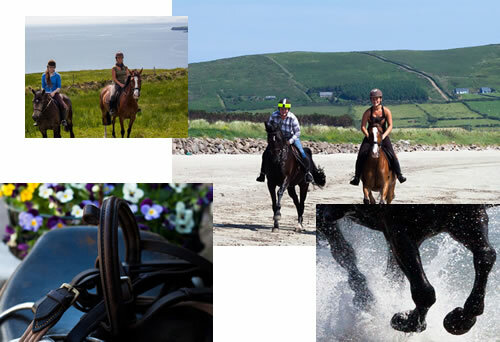 Burnham Riding Centre soon became the base for Instruction , Equestrian Sports , Trekking and Riding Holidays on the Dingle Peninsula. From this charming stable yard Burnham Riding Centre can provide a range of riding activities and can accommadate all levels and disiplines of riding . Groups are always kept to a mimium number enabling clients to get the best of their time in the saddle with us. Over the past 15 years Burnham Riding Centre has developed into a home for horse lovers , riders and equestrian enthusiasts from Ireland and aboard. Proud to share our collection of suberb Ponies , Horses , Irish Hunters and Trekking Cobs with you should you choose to visit us . We are open all year round allowing for your equestrain experience or those of you who want to ride and explore this magnificent peninsula in all seasons .